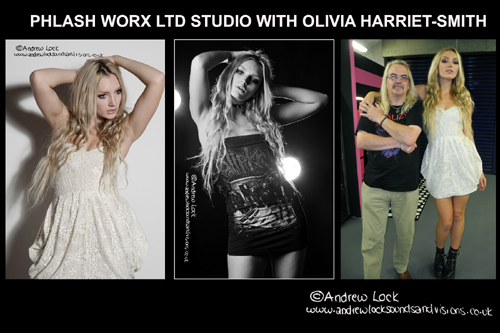 Recently opened in Leamington Spa is a fantastic new photography studio called Phlash Worx, this is something I have been waiting for in my home town for a long time as while I never want to give up my live music photography completely I have for a while wanted to have a real go at studio work. The studio is run by co owners Trevor and Stephanie the former resident photographer and the latter resident hair and make up artist, both really friendly and extremely helpful. The studio is a good size with top quality equipment including 4 X Bowens 500 Watt flash heads, a large selection of soft boxes, reflectors, flash triggers, various backgrounds and anything else you could need. All you need to take along with studio hire is your camera so no carrying/ setting up lights etc and putting up backgrounds as I have before when just hiring a room. There is a dedicated hair/make up area and a chill out section where tea/coffee is free when shooting. Basic studio hire is £20 ** an hour but there are big reductions for buying bulk blocks of hours. They have model days where you have the opportunity to work with a professional model on a one to one basis and Trevor is on hand to help out if you get stuck and these are usually priced between £45 - £50 an hour. I took part on the first of these days and had a fantastic hour with London based model Olivia Harriet Smith and you will see a couple of my shots with this blog and more in my ‘Studio- Models’ gallery. The studio also offer photographic and Photoshop workshops. Highly recommend these guys for all your studio photographic needs.